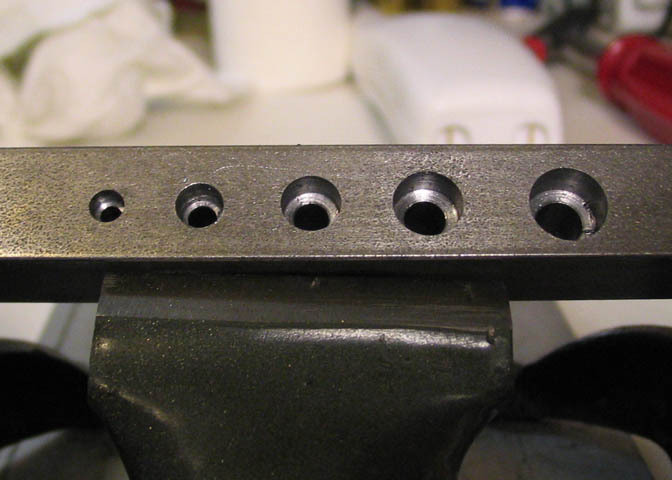 This article deals with counter bores, but the basics are the same for a number of tools. 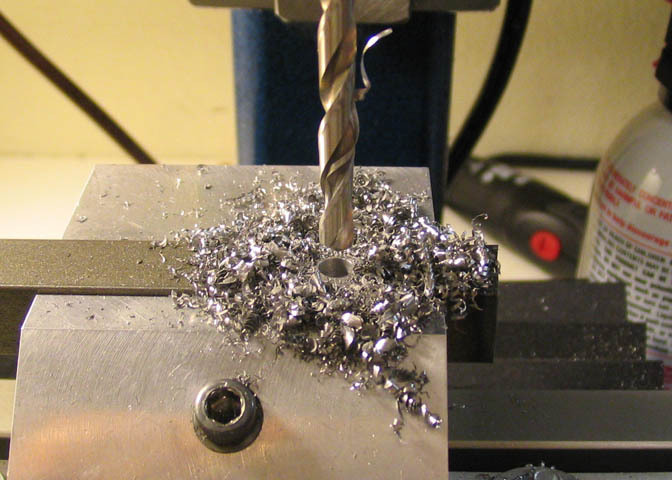 have some drill rod handy, (that's silver steel, for some of you folks across the water). 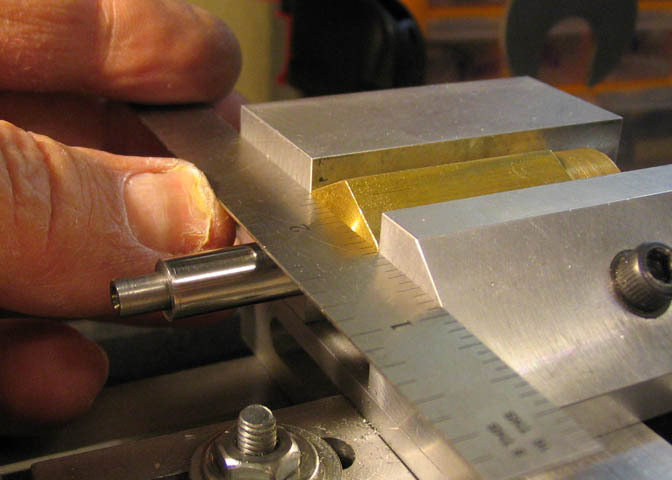 The first step is to cut the basic shape of your tool using the lathe. that I use, about four inches is good. much as can possible be. I made the pilot .190". That'll fit nicely in the through hole without galling when the cutter turns. and the cutter must be slightly larger than the head of the screw. 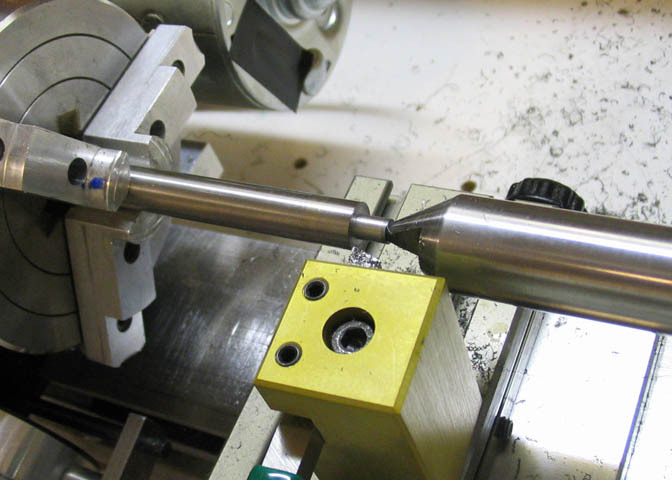 for a collet to be used in the mill, so it's left as-is for the tool shaft. 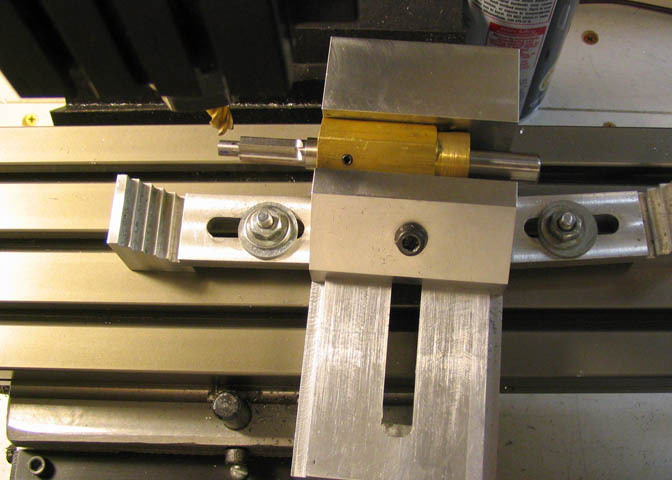 with the milling machine collet or what ever other tool holder is used with this cutter. from scarring the tool blank, which would make it hard to remove from the hex when done. six or four sided holders. 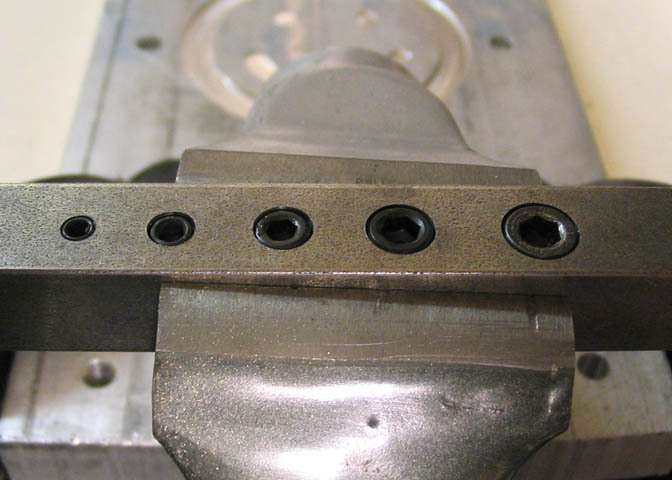 keep it from sitting flat against the vise jaws. all come out to the same depth. The above picture pretty much tells what is needed here, but I'll go over it to be sure. diameters, it changes. I've added info for some of those lesser diameters a few paragraphs down. The diameter of this part is .310". Half the diameter is .155". The factor used is .044. 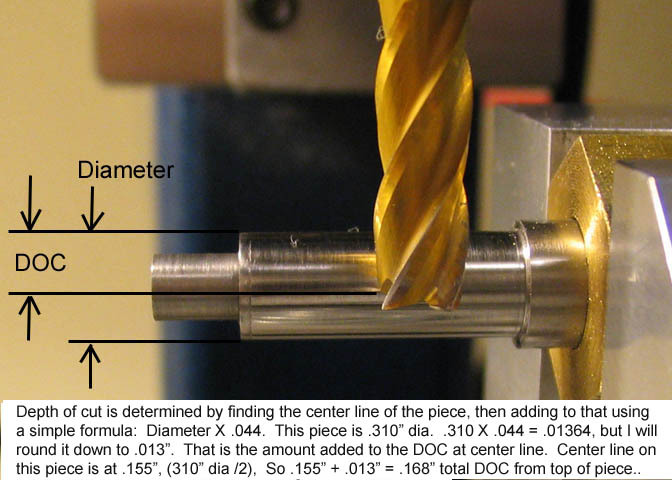 Diameter X .044 + 1/2diameter = total depth of cut from top of piece. 1/2 of the diameter is .155". Add .155" to .013" to get the total DOC of .168". 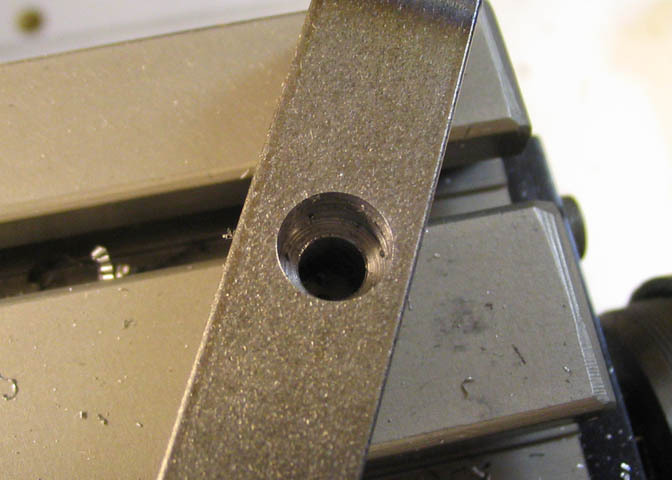 The same formula works for other straight flute cutters too, such as reamers and T-slot cutters. 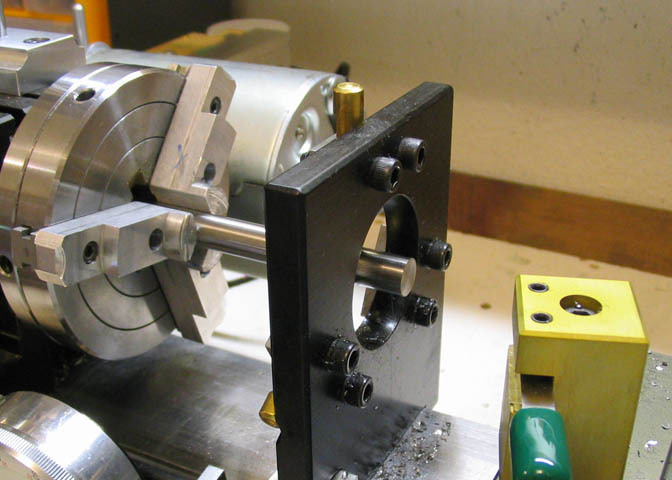 books and articles pertaining to machining practices. you want to run your mill in reverse when using this tool! bores I noted the factors that worked for them. These apply to six flute cutters. For a cutter .270" diameter, the factor is .026. For a cutter .230" diameter, the factor is .015. For a cutter .185" diameter the factor is .015. For a cutter .141" diameter, the factor is .010. 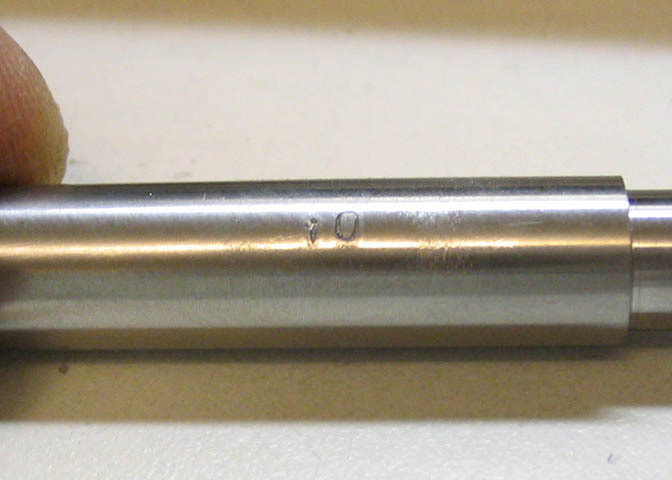 These four diameters coincide with counter bore sizes for #8, #6, #4, and #2, respectively. 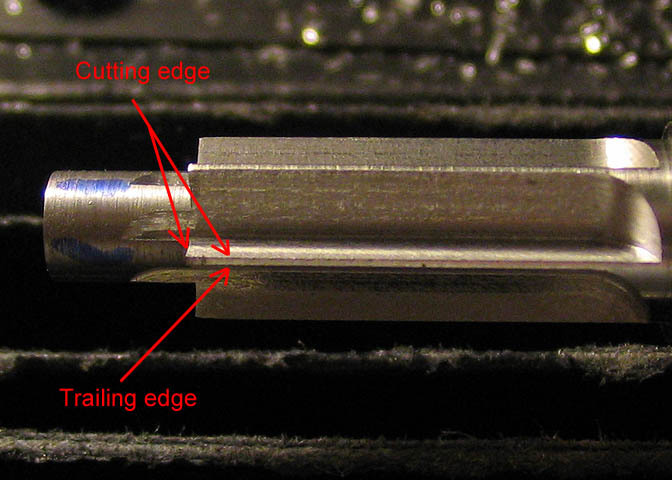 cutter with six flutes has a thin section from the cutting edge to the trailing edge of the flute. six flutes is used in this article simply because that's what I was making when I wrote it. to count the turns of the hand wheels. will be a good guide for the end of the flutes. 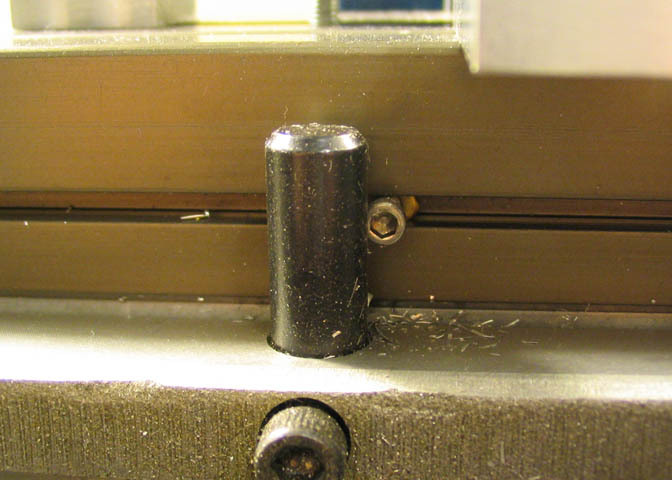 three cuts on the Y axis were .010", and after that were reduced to .005" until the cut was finished. If a smaller cutter is being made, the cuts have to be reduced further. flutes are cut to that in-feed. each complete flute), took about five seconds. The flutes are just over 3/4" long. marked "Trailing edge" doesn't do anything. Just follows the other guys 'round and 'round. on the cutting edges. Just keep it flat and everything will be wonderful. if you set them at 5 degrees, or 4 1/2, or 5 1/2. Get the vise in the ball park and it will be fine. In other words, don't sweat over 1/2 a degree that you can't even see on your protractor anyway. 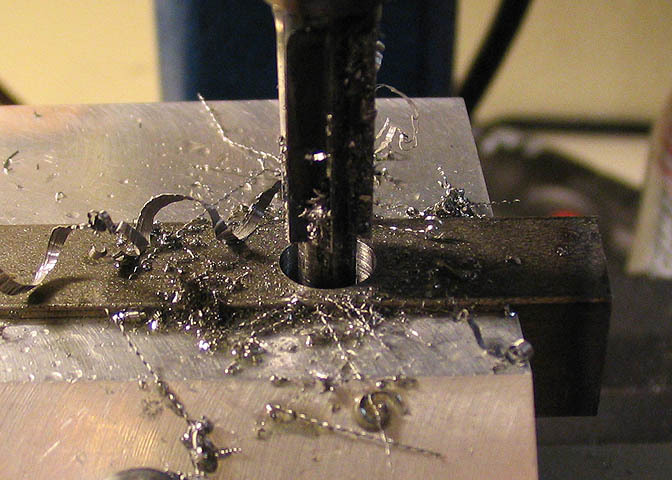 Unplug your milling machine before making the following adjustments. 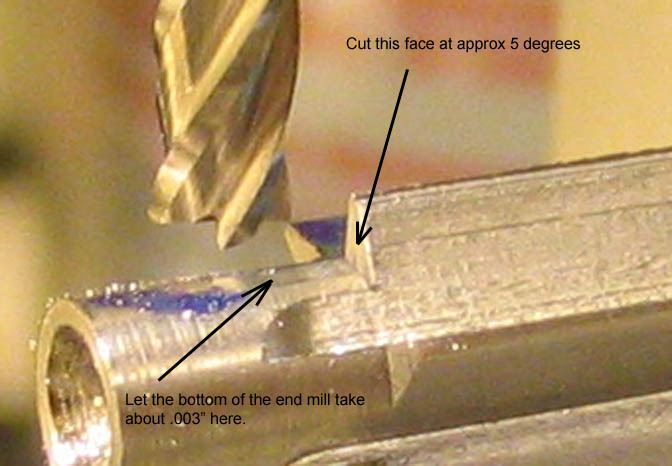 edge of the end mill. Easy to do. There is an arrow that says "Cut this face at approx. 5 degrees". 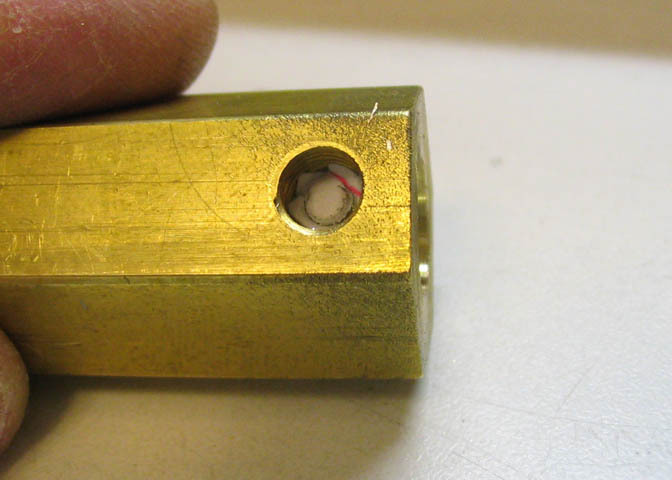 it there, loosen the set screws in the indexing block. It's okay to take it out of the vise if needed. 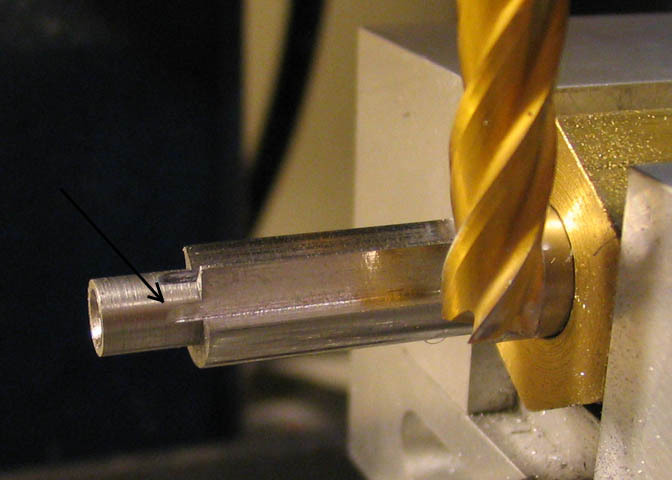 away from the end mill and tighten the set screws. Now you can plug in your machine and get to cutting. idea is to keep all the cutting edges at the same depth, so they all get a chance to do some work. cutting edges. Keep the stone flat against any surface you are working on. my best to make a simple explanation. paper towels, in case you make a mess. For the oil, I use 30 wt, but I expect that most regular motor oils will work fine. 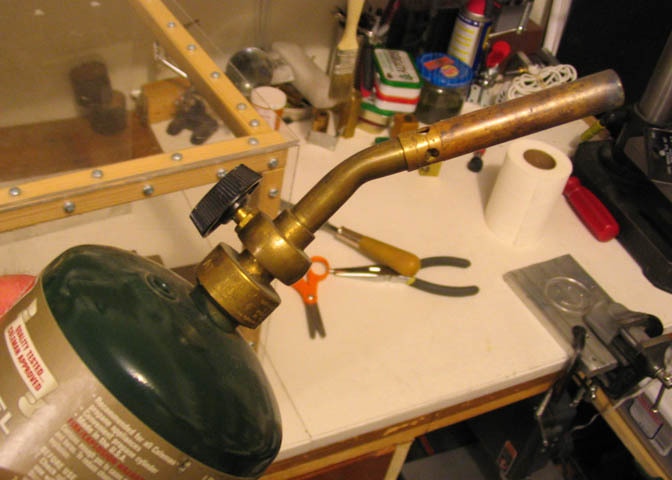 If you use water hardening drill rod for this, substitute a can of water for the oil. as it heats up. 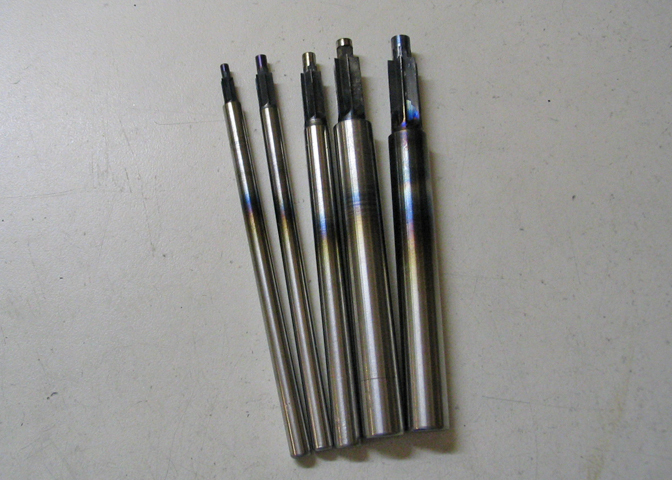 Only the cutting flutes and pilot need to be heated to the final temperature. as the business end of the tool. test to help you know when it's good. magnet-on-a-stick thing and try it against the piece while it is still in the flame. If you are "there"
wooden stick. If you've reached this stage where the magnet won't stick, it's at the right temp. Hold it there for as long as you care to, but a couple of minutes at least, or until you get bored. can touch it with your fingers without getting burned. in the oil for five minutes. so hard that it will probably shatter before you get good use from it, so it needs to be tempered. you don't heat the piece to bright orange. grit on it.) Don't let the sand paper rub on the cutting edges of the cutter. to one side of it, and when you polish, take care not to roll over the cutting edge. Keep it flat! The polished surfaces should be bright and shiny when you get done. Now it can be tempered. sharp eye on it. Rotate it 'round and 'round as you move it in the flame and watch the polished parts. As soon as it starts to show what is called "straw" color, plunge it into the oil. to figure it out if it was just called something like golden yellow. This part has to be watched pretty closely to get the right color and dunk it before it gets too hot. 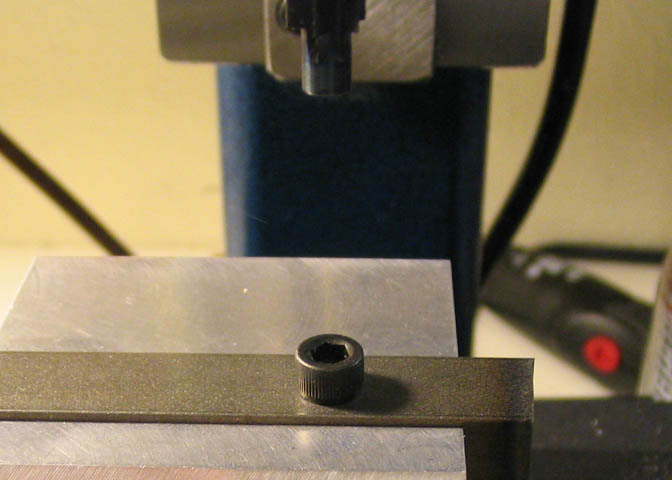 Tempering takes the brittleness out of the cutter while still leaving it hard enough to cut other steels. 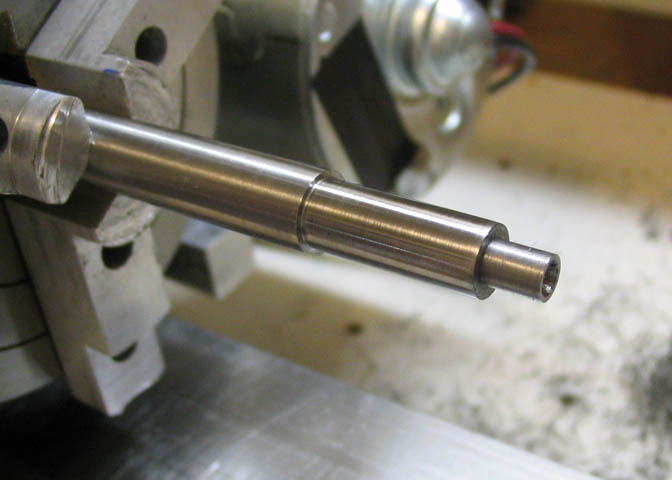 just described is useful for making tools from drill rod that will be used to cut other metals. Different colors are used for things like chisels, which are tempered for impact rather than sharpness. through a piece of square CRS. 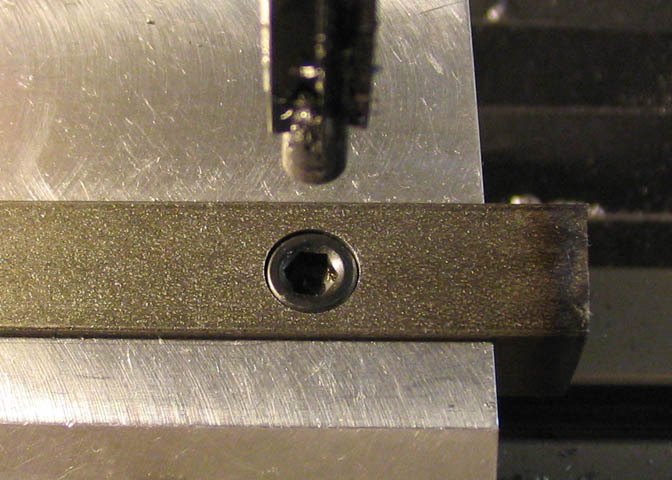 A #10 socket head cap screw is put through the hole to check that it's the right size. cutting fluid as it cut and the chips came rolling out. That's what it's supposed to do. A perfect fit for this size of cap screw. And a nice little counter bored hole. That's it, finished. Run it slow and use cutting fluid and it will last quite a while. on them since they turned black again on the second trip into the oil. I made up a set of these in sizes 2, 4, 6, 8, and the 10, all with six flutes. The pilot on the #2 at the far left is only .088", so it's pretty small. Numbers 2, 4, 6, 8, and ten, again.